While the Luminor and the Radiomir are famous names in Panerai parlance, there’s also the Daylight, which has significance in the brand’s modern history. Let’s find out the origins of the Panerai Daylight and take a look at a couple of examples. It was Hollywood actor Sylvester Stallone that brought modern Panerai from relative obscurity to must-have watch for the action-star set. 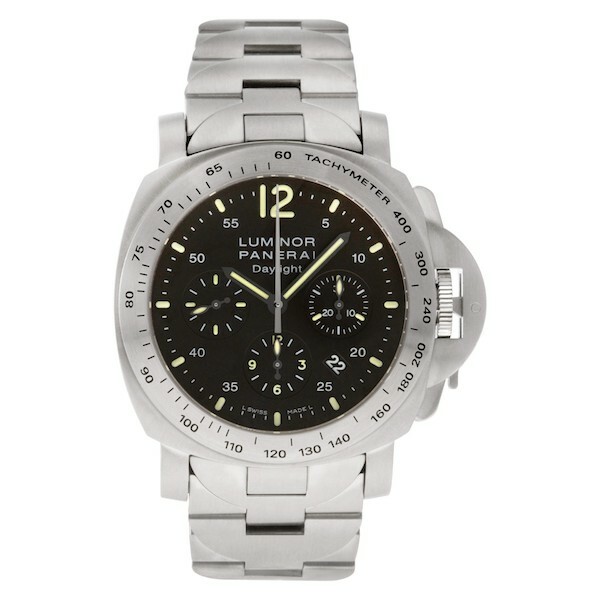 Sly was in Italy filming his movie Daylight when he came across a Panerai Luminor watch. Not only did he purchase one for himself, but he also commisioned a batch of Panerai Luminor Submersible pieces with “Slytech” on the dial and his signature engraved on the back. Following that, Stallone collaborated again with Panerai, this time including the “Daylight” moniker on the top portion of the Luminor dial along with “Slytech” on the bottom. This was the first time the Daylight name appeared on a Panerai watch. When Daylight the movie came out in 1996, a Panerai watch could be clearly seen on the wrist of Stallone’s character. As you can imagine, this brought great exposure for the Italian watch brand that was previously unknown in the U.S. What’s more, Stallone doled out Panerai watches as gifts to his friends, including other Hollywood heavyweights like Arnold Schwarzenegger. As a result, Panerai watches also made appearances in Arnie movies like Eraser. 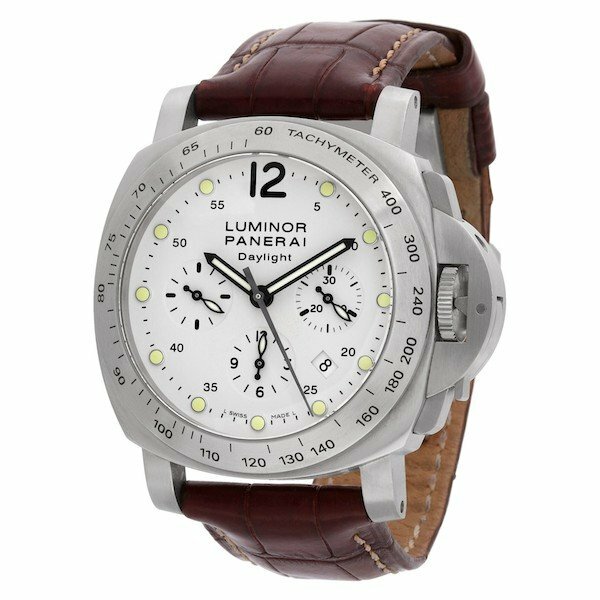 In the mid-2000s, which is well after the 1997 Richemont group acquisition (then known as the Vendome Group), Panerai released Luminor Daylight models in honor of the first Slytech Daylight watch by Stallone. Here are a couple examples. The Panerai Luminor Daylight Chrono PAM 251 sports a 44 mm stainless steel case in the familiar Luminor style case with the oversized bridge protecting the winding crown. However, as a chronograph watch, the PAM 251 also includes a tachymetric engraved bezel above the case and a pair of chronograph pushers on the right side of the case. Housed in the case is a fresh white dial–a nice change from the standard black dials we often see in Panerai’s line up. The lightness of the dial provides great legibility of the center hands and three subregisters during the day while the generous luminescence ensures the watch can be read at night too. There’s also a discreet date window tucked in between 4 and 5 o’clock. The Luminor Daylight Pam 251 runs on the COSC-certified chronometer OP XII automatic caliber (based on ETA 7753) with 46 hours of power reserve. Finishing off the look of this Panerai is a brown alligator strap fitted with a deployant clasp. he Panerai Luminor Daylight Chrono PAM 236 has the same 44 mm stainless steel cushion-style case with the tachymeter bezel and crown bridge as the PAM 251 detailed above. However, this time, the dial comes in Panerai’s favorite black color with plenty of white details for optimal readability. 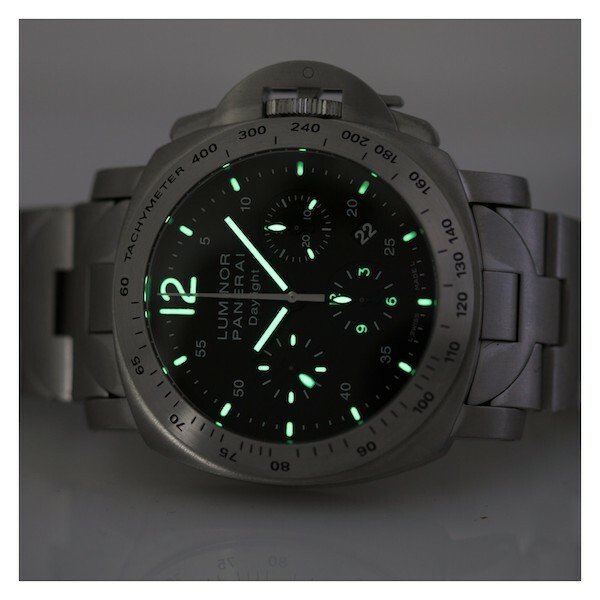 Naturally, as is standard with Panerai watches, there’s also an abundance of lume that comes alive in low light. Moreover, rather than a leather strap, the PAM 236 is equipped with a full steel bracelet, complete with a double deployant clasp. Steel bracelets are not particularly common in Panerai watches, so the metal band of the Luminor Daylight Chrono PAM 236 is a nice change of pace. The Panerai PAM 236 also runs on the COSC-certified chronometer OP XII self-winding caliber with a 46-hour power reserve. 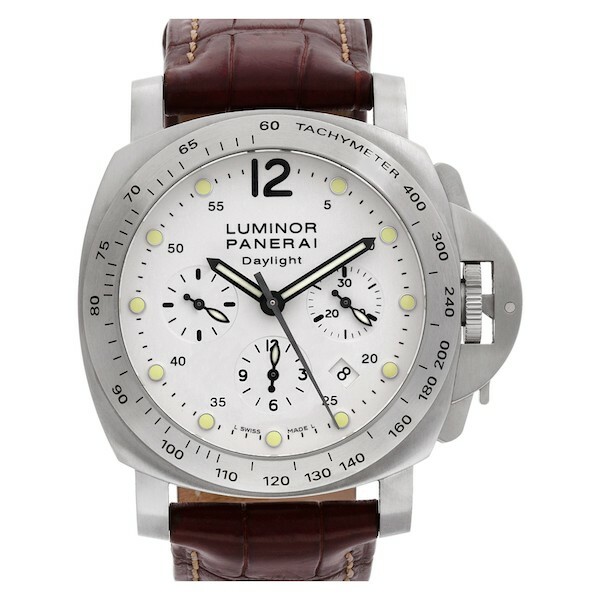 Thanks to its celebrity connection with Sylvester Stallone, the Luminor Daylight most definitely played its part in Panerai’s success. Today, Panerai watches are not only enjoyed by celebrities but by loads of regular folk too. And with their striking looks, dependable mechanical movements, and intriguing history, that’s no surprise to us!